Spring has officially sprung here in Denver, and with it comes an email inbox full of things I should most definitely delete but instead I lust over. So, to curb my craving (and possibly inspire yours) I thought I would share a few of the springtime items that I wish would make their way into my apartment! 1. The Hamilton Large Saffiano Leather Tote in Watermelon by Michael Kors. I love this bag. I may already have it in brown, black, and a gorgeous green (shown in this post) but watermelon is SCREAMING my name. Caps lock completely necessary. Gorgeous color? Check. Big enough for my laptop and a plethora of dog treats? Check. Shoulder strap? Check. Seriously sign me up. 2. In Bloom Collection by Teavana. Yes, I know I already have a cabinet full of tea and four (yep, four) teapots, but this set is SO gorgeous! I spotted it shopping with my mom in the Teavana in Boulder, and we had the chance to taste the teas that came in the set, and both of them are delicious! Plus, you really can’t go wrong with blooming teas- entertaining and tasty! I have never really been a scented candle fan until recently, but now I adore them. I was browsing Wild Mint and spotted these three candles (clockwise starting from top left) a Tru Melange Lavender, Tru Melange Aphrodisia (lemon and ylang ylang), and Tru Melange Enchant Soy Candle. These non-toxic soy and beeswax candles are scented with essential oils- no synthetic scents! I like to think that I’m eco conscious but I know I can always do a bit more. One of my dear friends Andrea has recently started Be Zero, a website and home consultation about zero-waste living. This cute little set is perfect for keeping trash at bay while packing a lunch! I popped by a blogging event at prAna in Cherry Creek and fell in love with their whole spring line, especially these Cleo Tee Shirts! They fit well – none of the super boxy weirdness that seems to be the trend as of late- and come in three gorgeous colors! Also, you can’t go wrong with a fun colored yoga strap like this Raja Strap! It is well made and perfect to go with your spring yoga clothes! 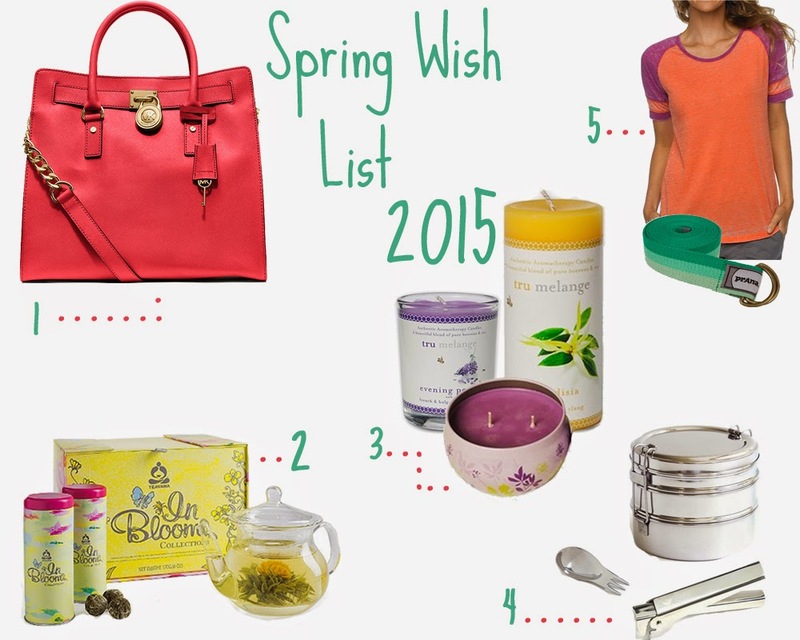 What have you been lusting after this spring? Let me know in the comments below! Some links are affiliate links. All opinions are my own.